New Jersey Devils: The players all say they're confident that new coach Peter DeBoer will last longer than John MacLean did last year, but hope he understands if they hold on to the receipt for his Secret Santa gift just in case. New York Rangers: Will once again rely on their all-world goaltending tandem of the starter, Henrik Lundqvist, and the backup, an exhausted Henrik Lundqvist. What to watch: Sidney Crosby, to see if he seems to be experiencing any post-concussion symptoms caused by the exertion of flipping over all the tables in the room after the thousandth time somebody asks him if he's been experiencing any post-concussion symptoms caused by exertion. Fearless prediction: The Flyers finally solve their chemistry issues and have everyone in the dressing room on the same page, according to captain Chris Pronger and 19 guys trembling in the fetal position. Winnipeg Jets: They've wisely learned from the mistakes of previous teams who moved from Atlanta to Canada, by making sure there wasn't already a better team in the same province who'd dominate them for the better part of the next decade. Washington Capitals: An overworked scouting staff will have to split time between watching potential first overall picks and Stanley Cup final opponents. Tampa Bay Lightning: Steven Stamkos has seemed quicker ever since he started training with Gary Roberts, although he mostly uses that quickness to run up to strangers and frantically ask them to give him some real food. Carolina Hurricanes: This team seems to have an awful lot of former Maple Leafs on it, a sobbing Paul Maurice just informed an empty bottle of malt liquor. Florida Panthers: The team's young defenceman absolutely need to stop getting undressed on opposing rushes, insists Rocco Grimaldi. What to watch: The awkward silence after self-proclaimed diehard hockey fans from the other four teams congratulate Winnipeg fans on having an NHL team for the first time ever. Fearless prediction: Their off-season spending spree has the Panthers mailing out playoff ticket order forms, although with Dale Tallon in charge the forms don't start arriving until July. Toronto Maple Leafs: Tim Connolly finally solved the team's long-standing need for a first-line center by arriving at training camp, pointing at Mikhail Grabovski, and saying "Um, he's been here for three years". Ottawa Senators: The team may not make the playoffs again for years, which is great since it should give the pre-game gladiator guy a chance to memorize his lines next time. Boston Bruins: While it sounded like a good idea when they booked it in mid-August, that "How to win when it counts" motivational seminar by the Red Sox now seems like a mistake. Montreal Canadiens: Proved once again that they have the smartest fans in the country, since you never see them tagging themselves in post-game riot photos on Facebook. Buffalo Sabres: Ville Leino and Christian Ehrhoff should provide the Sabres with production at a fraction of the cost of similar players, in the sense that 3/2 is technically a fraction. What to watch: The Ontario provincial election returns on opening night, since it may be the only chance all season to see anyone from that province win something. Fearless prediction: In his first game against the Bruins since breaking his neck, Max Pacioretty slams Zdeno Chara face-first into the stanchion in an attempt to do some retaliatory damage to the stanchion. The stuff on the Flyers was gold. Another one of my favorites was the Montreal fans tagging themselves on Facebook. Loved the line about Rocco Grimaldi, great post. I LOL'd so hard at those. Amazing. The Boston comment cuts deep, but I console myself by cradling one of the seven championship trophies received in the past decade. 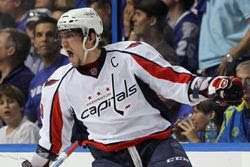 The Washington Capitals thingee was brilliant. Florida, Toronto, Boston, Montreal, and (especially) Buffalo had me in stitches. Well done. Low blow on the provincial joke, but funny as hell. What happens if it's a minority? "What happens if it's a minority? " Much like Aliens vs Predator, whomever wins... we lose. DGB is back in true October Form!! I think you may have offended the forty-two diehard hockey fans from the other four Southeast Division teams. You are a pillar to aspire to for all leaf fans. Kudos. Hahah, Rocco Grimaldi reference! Very nice! Matt Cooke says he understands that his attempt to reform his game will have ups and downs, but still admits he could do without Brendan Shanahan randomly jumping out of the shadows, hitting him in the nose with a rolled up newspaper, and yelling "NO to whatever you were thinking just now." hahah love the grimaldi reference! Stamkos line and the Gladiator line were pure gold! Chris Pronger & 19 cowering teammates!! I'm gonna be giggling for DAYS!